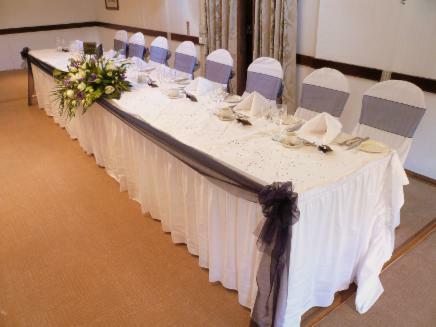 Organza Table Runner for Guest Tables £7.50 each These are to fit the average sized round banquet tables used by hotels and function venues, around 8 - 12 place settings. Organza Table Runners for Top Tables £15.00 each These are to fit an average sized top table for around 10 place settings. Runners are Approx 30cm wide. 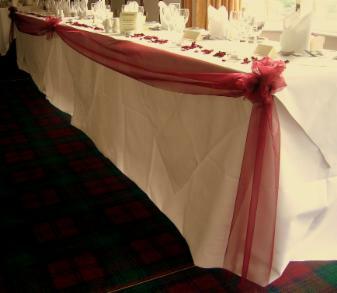 Why not coordinate your tables with your chair cover sashes using organza table runners? These allow you to add some colour to the table top, and bring the whole colour scheme together. If you are using tables of different sizes or shapes to the ones listed above, please let us know the dimensions of your tables and we can give you an accurate quote. Runners are available in a variety of colours to suit your event theme. Please see below for list of colours available. Organza used for swags is approx 30cm wide. Table Swags can be used to decorate the front of any of the tables at your venue. 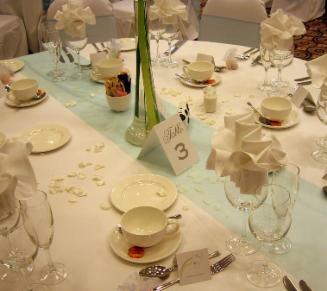 They are most commonly used along the front of Top Tables, Ceremony/Registrar's Tables, and Cake or Gift Tables. White, Ivory, Gold, Silver, Baby Pink, Fuschia Pink, Peach, Baby Blue, Navy Blue, Turquoise, Moss Green, Bottle Green, Pale Green, Yellow, Lilac, Purple, Burgundy, Orange, Red, Chocolate Brown, Black. Please remember when choosing colours, that as organza is a sheer fabric, it can get 'lost' when set against a background of a similar shade. For the best impact, we would suggest choosing colours that contrast with the table linen.